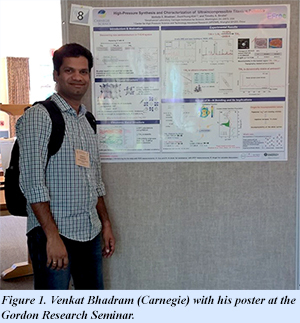 EFree Postdoc Venkat Bhadram (Carnegie) was one of three selected for best poster awards at the Gordon Research Seminar, which was held before the Gordon Research Conference in July at the Holderness School in New Hampshire. The winners of the poster awards gave five-minute short work presentations during the Gordon Research Conference. His poster, "High-pressure synthesis and characterization of ultraincompressible titanium pernitride," was co-authored by former EFree Technical Coordinator Duck Young Kim and EFree Associate Director Tim Strobel. "The study of transition metal pernitrides has been an active area of research for quite some time. However, most of the pernitrides synthesized so far are belong to noble metal group. We report the discovery of first non-noble metal pernitride, TiN2, which was synthesized by reacting TiN with N2 at 73 GPa in a laser-heated diamond anvil cell (DAC). Our in situ pressure dependent x-ray diffraction studies suggest that TiN2 is recoverable at ambient conditions in a crystal structure that contains single bonded nitrogen units (N2 dumbbells) embedded in the metal lattice and exhibits high bulk modulus (in the range 360-385 GPa) which is usually observed in superhard materials. We have performed ab initio calculations to understand the electronic properties and bonding nature in TiN2 and thereby elucidate the origin of incompressible behavior of this material which is rooted in the nearly filled anti-bonding states of the pernitride units. To our knowledge, this is the first experimental report on TiN2 which is the only light metal pernitride exhibiting bonding-mechanical property relation that is usually seen in heavy metal pernitrides. There is an ongoing effort to synthesize new oxynitrides in Ti-O-N system with the two end members of this series, i.e., TiO2 and TiN2 are now known."